I am sitting in Central Texas watching televisions and whom might I see? YOU and your sister…will your idea make millions? Of course, it will! I am so excited for you. I will continue to spread the word about your amazing personalized service! Feel free to use my note as a testimonal. I saw you and your lovely (both of you are) sister on TV before I left for Chicago. I thank you so much for mailing your SENDaBALLs via the Postal Service. It’s getting to be I look for them every night..and when I run across one, I just smile and say…”I know Michele would want me to get this forwarded ASAP!” So…look at it this way…you’ve outbounced the competition! I commend you and your sister on a fine business! Again…please stop by and say “Hello” sometime. I truly believe that you both should have a “MySpace” site too…it would spread all over! Lots Of Love & Much Peace To You Both! I’ve actually been meaning to send you guys this story, but I’m a busy law student and keep forgetting. My boyfriend’s little sister was 8 years old this past Christmas and had been questioning whether Santa existed. Christmas is one of my favorite holidays and I like keeping kids believing in Santa as long as possible. My boyfriend had sent me a Send-a-Ball a couple months earlier and I thought it was wonderful. When he told me his sister was doubting Santa, I knew Send A Ball would keep her believing. 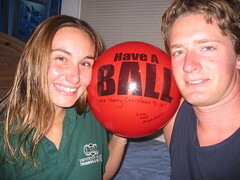 About two weeks before Christmas, I sent her a ball–from Santa. A few days later, it arrived at her house. She found it on the porch with their mom after school. Immediately, she asked if mom had sent it. When mom said no, she was like “…so Dad sent it?” Mom again said no. His sister looked confused for a minute and then became really excited. She picked up the ball and said “What did I do that was so good Santa sent me a ball early?” After that, she and the ball were inseparable. She even thanked Santa for the ball in her Christmas Eve note accompanying his milk and cookies! In essence, you guys have helped make sure my boyfriend’s sister will believe in Santa hopefully for years to come. An impressive feat, given her age and the way kids are today! I heard about Send A Ball on Johnny B’s show – I thought I would send it to my daughter and son-in-law for their second wedding anniversary. Sabrina was home the day the mail lady pulled up to their mail box for street delivery. She watched the post lady from a small window attempting to fit “whatever” in the mail box without any success, eventually forcing her to exit the truck and put the delivery on the chair on her front porch. Sabrina waited until the mail truck pulled away and down the street before she opened the door slowly, her dog, Bailey, was excited to see the ball. Within minutes, she was in the house and calling me at work to tell me I was crazy and couldn’t wait for her husband to come home to see what her crazy mother sent. 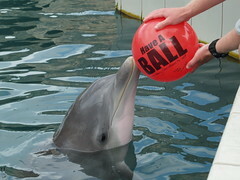 Who needs a beach ball when you can have a Send a Ball? I would like to thank you for helping me make my sister’s day. She is a dolphin trainer in Bermuda and although it sounds like an amazing job, it still has its ups and downs. The bouncing ball she received, complete with the Christmas wish, certainly made her smile. Living so far away from her is hard, but it was great to know a ball could cheer her up. Thanks again for an amazing idea! My daughter Gabby was having a very bad week. She slammed her finger in the car door one day, which resulted in the loss of her finger nail. Then the next day she fell off a swing and hit her head on the swing set pole at pre-school. We had to take her to Urgent Care to make sure she didn’t have a concussion. She ended up with a black eye for a week. My mother-in-law phoned to check in on us and we told her about Gabby’s mishaps. 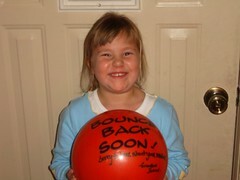 Within a couple of days we got this red ball in the mail that said, “Bounce back soon . . . Sorry to hear about your accidents, Grandma Jeanne”. It was the neatest thing ever! My daughter was bouncing it on the floor when I got home from work. My husband told me that it had come in the mail from his mom. Gabby couldn’t have been happier, it really made her accident week better. My mother-in-law had gotten a ball herself from one of her co-workers as a thank you for a project she had done at work and thought it would be a good “pick me up” for Gabby. Then after we got the ball a co-worker of mine , Deanna, had just had reconstruction surgery for breast cancer. I thought this would be a good “pick me up” for her. I sent the ball to her. Her husband had to go in the post office to pick up their mail. She said when he came out of the post office he was laughing. He couldn’t believe an inflated ball had come through the mail. Deanna said it really made her week after having to sit at home and recover from surgery for so long.